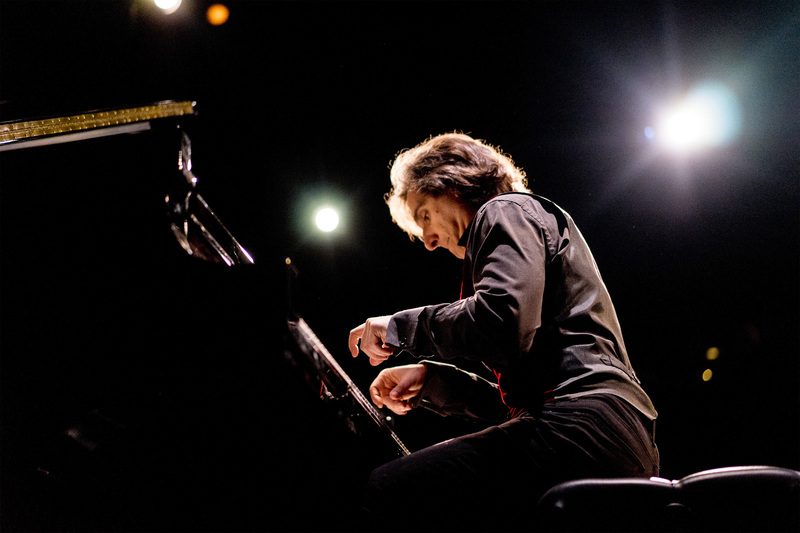 Hershey Felder brings another of his unique musical biographies to TheatreWorks. The Bay Area premiere of Our Great Tchaikovsky gives audiences insight into the life of Pyotr Ilyich Tchaikovsky. 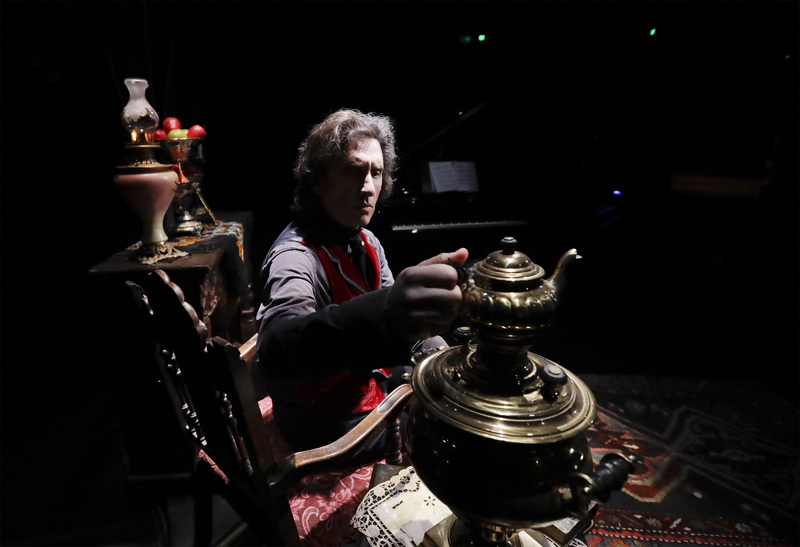 Like the other portrayals Felder has done in previous seasons, he takes on the persona of Tchaikovsky, as well as of various people in the composer’s life. Compared to his portrayals of Irving Berlin and Ludwig van Beethoven, this one is a little different. It is different because his subject is a little different. Tchaikovsky, while a musical genius, led a personal life filled with fear, strife, and chaos because he didn’t fit the social mold demanded by his culture. The composer’s music is still front and center in this production, music that Felder dispatches with his characteristic verve and virtuosity. He is as adept at playing Tchaikovsky’s music as he is at playing the music of Berlin and Beethoven. The changes this time are that he adds a bit more of himself in the storytelling, and the story itself is much darker than the previous Felder shows that have reached the TheatreWorks stage. Our Great Tchaikovsky begins with Felder taking the stage, not as Tchaikovsky, not as a close associate or family member from the era, but instead in current time, as himself. Before unveiling the story of Tchaikovsky’s life, he reads a portion of a letter he says he received from the Russian government during the development of this Tchaikovsky profile. The letter is both exhilarating and frightening as it is an invitation to Felder to bring his production to Russian soil. As the story unfolds, it becomes clear that if the letter is real and he were to accept the invitation contained therein, he would need to be circumspect regarding which Tchaikovsky story he would tell. Tchaikovsky’s music is internationally renowned, particularly his symphonic works (which include the ballets). He also composed a wealth of piano works, which Felder claims have been personal favorites of his since his own childhood. What is less well-known are the circumstances surrounding Tchaikovsky’s life, lifestyle, and his death. There is a great disparity between what is reported inside and outside of Russia. Tchaikovsky was a gay man living in a society that condemned such behavior. He lived in fear of being found out, and if discovered, of being tortured and sent to Siberia. Per Felder’s reports of recent events and ironies, not much has changed since Tchaikovsky’s time. One such irony was that a portion of “The Nutcracker” was used in the opening ceremonies for the 2014 Sochi Winter Olympics, despite the fact that the composer, were he alive today, would likely be exiled. Felder digs deeply into Tchaikovsky’s life, starting with his childhood when he was strongly discouraged from pursing music as a profession, or even as an avocation. He was told that music wasn’t for boys; it was for ladies. He was instead sent away to a school of jurisprudence to prepare for a career in civil service. Through his exposition of Tchaikovsky’s early life, Felder injects some lesser known music, emphasizing how the budding composer continued to pursue his personal musical development, despite the admonishment he received from his family. Felder educates the audience about how Tchaikovsky eventually earned entrance to a new conservatory after beginning a short-lived career in public service. Once in the conservatory, Tchaikovsky’s music flourishes, and he ultimately becomes the composer today’s classical music lovers have long admired. Along the way, Felder makes clear how tortured a life Tchaikovsky led, never comfortable in his own skin, his longing for love and acceptance hidden from public view for fear of severe punishment. Tchaikovsky’s one enduring relationship as an adult was long distance with his benefactor. Nadezhda von Meck sponsored his work over the course of 13 years before suddenly ending their association, the reason for which Tchaikovsky never knew. Their association was via hundreds of letters. According to Felder’s telling, they accidentally saw one another twice, but they never spoke. Felder relates the sequence of Tchaikovsky’s life in his typical fashion, as the composer himself, adding a few characters and conversations with some close associates such as his mother and his conservatory friend and critic, Nikolai Rubinstein. He carries on conversations with them, playing all parts. As Tchaikovsky, he adopts a reasonable Russian accent. Although the storyline is dark, Felder lightens the mood at times, playing on the irony of various situations and accessing the humor where possible. And he injects copious portions of Tchaikovsky’s music. His performance of various symphonic works is impressive, often playing both solo and orchestral parts. At one point, he begins the famed Piano Concerto No. 1 in B-flat minor, Op. 23, singing the orchestral parts while playing the piano solo. He then adroitly switches to playing both accompaniment and solo parts on the piano. In other works, orchestral accompaniment is played through the sound system while Felder plays the piano live. Felder’s longtime collaborator, Trevor Hay, directs this production, although it’s really Felder’s show. In addition to starring in this one-man performance as actor and musician, Felder wrote the book and designed the set. The set is grandiose, with a Steinway grand center stage. Trees are prominently situated upstage. A writing desk, portrait (which is worth watching as the characters in the scene change), and the hint of a dining area flank the piano. As with other Felder composer stories, projections, designed by Christopher Ash, are prominently displayed upstage across the full width of the stage. This time, they add depth and provide realistic scenes of rural Russia, complete with birds flying through the forest and deer grazing as the snow falls. Cityscapes appropriate to various locations also abound, as do ornate architectural views. The combination of concert, culture, and conversation make this a compelling production. Felder presents some of the controversy, and even conspiracy theories surrounding the circumstances of Tchaikovsky’s death without injecting his own opinion. The music is affecting; the story is disturbing and enlightening; and the production is stunning. See Our Great Tchaikovsky, email boxoffice@theatreworks.org, or call (650)463-1960 for more information or to order tickets. ← Spreading holiday spirit and wishing a very merry SaxMas to all!